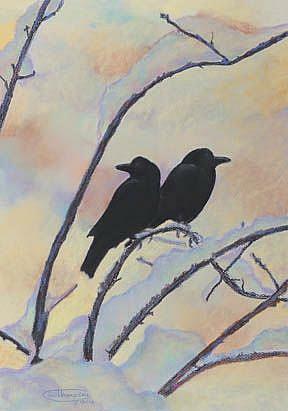 "These two crows seem to be delighted to be perching high on snow covered limbs on a winter's 'snowy morn'." Artist Comments: "In this scene, I used a limited palette of pastel to portray a feeling of a cold winter morning. Fresh snow has fallen overnight. A pair of crows rests momentarily as if trying to decide which way to go to find breakfast. I chose Canson Mi-Teintes paper for its' texture and light weight." This image is available as a limited edition gicleeprint on paper and canvas from an original painting by Carol Thompson. Edition length is 3600 authorized, signed, limited edition prints (3500 numbered and 100 artist proofs). Please visit my website for prices and availability of the original painting.